To Sylvia Pankhurst, suffragette, anti-fascist campaigner, internationalist. From Sam McCormick. Dear Sylvia Pankhurst, I want to thank you for being so wonderfully you. 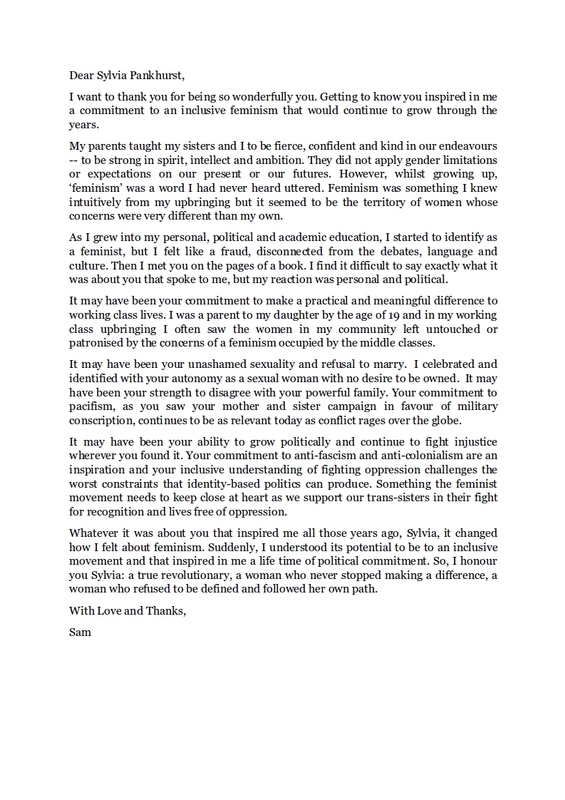 Getting to know you inspired in me a commitment to an inclusive feminism that would continue to grow through the years. My parents taught my sisters and I to be fierce, confident and kind in our endeavours – to be strong in spirit, intellect and ambition. They did not apply gender limitations or expectations on our present or our futures. However, whilst growing up, ‘feminism’ was a word I had never heard uttered. Feminism was something I knew intuitively from my upbringing but it seemed to be the territory of women whose concerns were very different than my own. As I grew into my personal, political and academic education, I started to identify as a feminist, but I felt like a fraud, disconnected from the debates, language and culture. Then I met you on the pages of a book. I find it difficult to say exactly what it was about you that spoke to me, but my reaction was personal and political. It may have been your commitment to make a practical and meaningful difference to working class lives. I was a parent to my daughter by the age of 19 and in my working class upbringing I often saw the women in my community left untouched or patronised by the concerns of a feminism occupied by the middle classes. It may have been your unashamed sexuality and refusal to marry. I celebrated and identified with your autonomy as a sexual woman with no desire to be owned. It may have been your strength to disagree with your powerful family. Your commitment to pacifism, as you saw your mother and sister campaign in favour of military conscription, continues to be as relevant today as conflict rages over the globe. It may have been your ability to grow politically and continue to fight injustice wherever you found it. Your commitment to anti-fascism and anti-colonialism are an inspiration and your inclusive understanding of fighting oppression challenges the worst constraints that identity-based politics can produce. Something the feminist movement needs to keep close at heart as we support our trans-sisters in their fight for recognition and lives free of oppression. Whatever it was about you that inspired me all those years ago, Sylvia, it changed how I felt about feminism. Suddenly, I understood its potential to be to an inclusive movement and that inspired in me a life time of political commitment. So, I honour you Sylvia: a true revolutionary, a woman who never stopped making a difference, a woman who refused to be defined and followed her own path. suffragette, anti-fascist campaigner, internationalist. Born 1882, died 1960. More information about Sylvia Pankhurst.